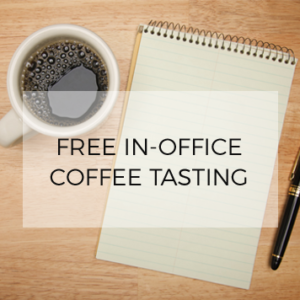 If your office is full of premium coffee enthusiasts, whole bean is for you. Whole bean coffee has a fresh-off-the-farm vibe that coffee lovers yearn for. Nothing quite compares to receiving a bag of coffee that was harvested directly from one of the most renowned coffee farms in the world and then roasted to perfection. US Coffee carries tons of varieties, roasts and flavors in whole bean form, from big brands like Starbucks and artisan coffee roasters like Intelligentsia. We guarantee even your most adventurous coffee drinkers will never get bored with our selection. If whole beans are properly stored, a cup of coffee brewed using whole beans grinded just before use is the freshest way to consume coffee. Another benefit of whole bean coffee is you can grind your beans for a different brew method each time, depending on what you’re craving. Grind your beans coarsely when making French press coffee or grind them fine if using them for an espresso machine. When using whole beans, you don’t have to limit yourself! With US Coffee’s large selection of bean-to-cup brewers, you get to brew coffee in the office in its purest form. Every cup takes you back to a small farm, in an exotic location, where beans are harvested and roasted to perfection. You shouldn’t have to settle for anything less than that. Choose from the de Jong Duke Virtu 90 Series, Coffeea Vacuum Brewing Series, VKI Eccellenza Touch, de Jong Duke NIO, Cafection Total 1, Cafection Total Lite, WMF 1400, Starbucks iCup, Starbucks Serenade Brewer, Newco Eccellenza Café and Newco Eccellenza Express. US Coffee understands how hard it is to choose the perfect office coffee service. That’s why we let you try one of our bean-to-cup brewing systems and provide a coffee tasting – for free. Sign up today!